Dad's workshop was painted in a deep emerald green colour and lay to the side of our garden. It was always locked when he wasn't around and I was forbidden to go anywhere near it. Of course I now know that it was for my own good, but way back in the 1950s and at the age of 10, it all seemed so cruel and unjust and I was constantly longing to enter into this forbidden place full of strange whirling noises and even stranger smells. I mean, what was the big deal? After all, it was only a shed. Granted, it wasn't like my friends' dads' sheds, which were usually made from any old bits of wood that their dads could lay their hands on. These sheds were a real mismatch of old crates and orange boxes with odd looking doors swinging precariously on to bits of old leather in place of proper hinges. Most of them had no proper windows to speak of, just a small gap half way up with a bit of old sacking hanging down to keep the weather out. But odd as they were, there were no restrictions as to who could enter them and to a gang of small children one day they were a secret hiding place, then on another they became a castle. So why was Dad's shed so different? Mum's washing line stretched from the top of Dad's shed to a pole half way along our garden. Dad was far from happy with this arrangement and was constantly saying to Mum that he was going to put another pole and re-route the line away from his beloved shed, but Mum was having none of it, as it would mean she would have to then tread on the grass and she wasn't happy about that if it had been raining. "You put me in a new path and I'll let you move the line, Bob," she would say sternly. "I will, love," he would reply, "just as soon as the weather brightens. Alright if I move the line at the weekend, though?" "No, Bob, do the path first then move the line." Dad knew he was no match for her; she was as sharp as a button. He never got round to doing the path and the new pole lay behind the shed for as long as I can remember. The main reason for Dad's lack of spare time was his hobby or as mum would say, "his other love." Dad was a milkman and would start work long before I got up in the morning and more often than not be back home before I got home from school; sometimes he would be having a cup of tea with Mum in the kitchen, but mostly he was in his workshop labouring away with his other love. 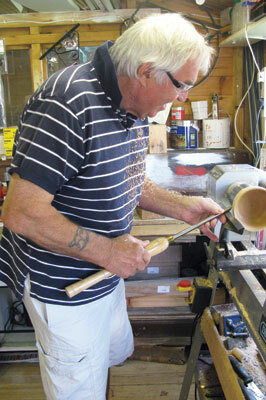 Dad was a woodturner. When other dads around here kept chickens, rabbits or even pigeons, Dad would turn wood; he didn't get satisfaction from growing vegetables or flowers like most of my mates' dads' my dad would turn a vase, bowl or some other little trinket. He was always on the lookout for bits of wood no matter where we went; even on holidays we seemed to come home with lumps of old wood and get the strangest of looks from our fellow passengers on the train journey home. I remember once when he enlisted help from my uncles George and Alfred; they were both builders and owned an old Ford van. Dad had got wind of a old wood yard that was being demolished a few miles away making way for a new housing estate and guessed there would be a real possibility of obtaining some decent lumps of wood very cheaply, if not for free. Dad took me along for the ride with my uncles and I thought I was a real grownup sitting up front and laughing away with them at all their jokes, but not really understanding a single word. Of course, all three knew this and laughed even more at my innocence. I know Dad loved me very much, but no matter how much I tried to enter into his domain as a small child he managed to thwart my every move which only made the need to see inside even more so. The shed had two good sized south facing windows that let in a rich abundance of sun light; he had made two solid shutters that closed down from the inside when the shed was not in use, but opened up fully on a pulley system when he was working in the shed. The windows were about 4ft up from the ground which at just over 3ft in height made it impossible for me to see inside; what I needed was the help of a few boxes, or perhaps a chair. I first tried a chair, but Mum caught me dragging one out from the kitchen and with a swift clip around the ear I was made to put it back. I knew we had a set of step ladders, but Dad kept them in the shed so they were out, and then I remembered the two old brown ale beer crates that were kept between the shed and the fence. The first one came out easily and I soon had it positioned under one of the windows, but it still wasn't high enough and I returned for the other one; this one was stuck fast and I had to pull really hard to shift it. Of course, I thought I was being as quiet as a mouse, but Dad was fully aware of what I was up to. Gingerly I placed the second crate on top of the first; I was clever enough to place it the opposite way to the first which gave me a step up and once there stood like Nelson on top of his column peering warily into the unknown. Dad pretended he didn't see me and for the very first time I gazed in awe at the secrets of Dad's workshop. He was standing close to some sort of very large and noisy silver machine with what looked like a long and shiny metal pole in his hands. There was a large piece of strange looking wood attached at one end of the machine and it was rotating faster than anything I had seen before, then all of a sudden Dad poked it with the pole he was holding sending long ribbons of wood into the air. It all looked very dangerous to me and stupidly I called out, "bloody hell!" I didn't really know what this term meant, but I'd heard Mum and Dad say it when they were surprised by something. Of course, Dad wasn't so understanding, stopped what he was doing and came hurriedly out of the shed. I'd seen his face this angry before and knew instantly I was in trouble and began to wobble precariously on my perch with the inevitable result of me falling off. I bumped my head on the path and cried loudly with the pain of it all which brought Mum rushing from the kitchen. By the time she reached me Dad had already picked me up. "Serves you right, you stupid boy, what do you think you were doing swearing like that?" he said. "Swearing? What swearing" mum demanded to know. Luckily for me, Dad played down the true course of events and although I got a rollicking for swearing, Mum blamed Dad for letting me climb up the shed in the first place. "I blame you, Bob; if you didn't keep your bloody shed so secret David wouldn't be climbing up the bloody thing trying to get in." "But, but.." Dad would stammer. "No bloody buts about it Bob, show the boy what he wants to see and be done with it." Reluctantly Dad led me into his workshop and began to show me what he was about; the long rows of turning chisels that he had either made himself, bought new, as and when he had the spare cash, or had bought secondhand from various other turners. 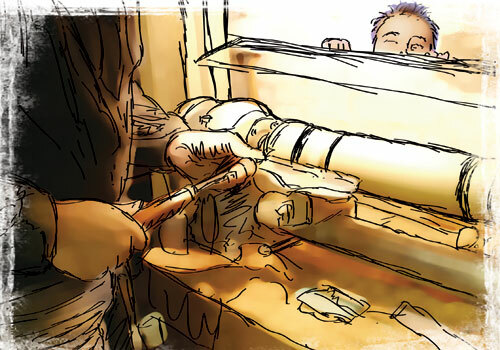 Just by the window was the machine responsible for the mysterious whirling noises I had heard so many times; Dad called it his trusty Dunlap lathe and showed me how he turned a square piece of wood into a round cylinder then altered its shape once more with a delicate little twist and beads. It looked really scary to me so I kept well back, but I have to confess even at that young age, I was impressed with Dad's expertise. Outside and in various places throughout the garden Dad had built little wood stores where he kept no end of logs, planks and other pieces of wood, as in all of them there seemed to be no order to the stacks and rows, but here in the shed there was order and tidiness with all shapes of timber neatly stacked, some with numbers painted on them and some that looked like they were ready for the fire. Dad had a little woodburner at one end and he laughed when I asked if the little pile to one side with the strange little bumps on them were firewood. "Firewood indeed, David. This is called burr wood - very hard to come by, son, and some of the most difficult to turn, but they're well worth the time and effort. Here, have a look at this." He handed me some sort of highly polished bowl that reflected the bright light above us so vividly that it seemed to change colour in front of my eyes. At first glance it was brown and then a sort of reddish beige, and then the little black specks seemed to take over and it became a mass of polished black; the same sort of brightly polished black that Auntie May's piano was made of. "Wow, that's magic," I exclaimed. "No, not magic, David," Dad laughed, "that's burr." As I walked indoors I seemed to notice all the things Dad had turned in the past; there were fruit bowls, some holding wooden apples and pears, and even the odd wooden egg or two; candlesticks of all shapes and sizes and endless amounts of little trinket boxes. All the rooms in our house had a vase or two, some tall, some wide and others very slim, but like all the other pieces they were highly polished and as smooth as smooth could be; in fact I think like most turners' houses our home was crammed with Dad's handy work. It's funny how all these things had been part of my home for as long as I could remember, but I really had no idea Dad had made them all. That night and after my visit to Dad's shed I saw them in a new light. These were things my Dad had made out of every day lumps of old wood. He had cleverly turned them into something beautiful and useful. Finally and after all my longing to find out his secrets, I discovered that my father was a gifted man, and if I played my cards right, he might teach me to turn wood, too.